Leave it to the producer of Roland Emmerich’s numerous disaster movies to make perhaps a disaster movie that outdoes all of them combined in the stupidity department. Dean Devlin, Emmerich’s long-time producer, makes his directorial debut with – what else? – a disaster movie that is fascinating to watch, and even more fascinating to talk about afterwards. The reason for that is because Geostorm is so brain-dead right from the very start, and somehow continues to get dumber with every passing minute, that it’s actually a miracle it’s even living and breathing without any assistance. It’s worth pointing out that this is a movie that has been delayed numerous times over the last year or so, gone through heavy reshoots with producer Jerry Bruckheimer even being brought on board to oversee things, and constantly been the topic of debate in Hollywood over whether to release it at all in light of recent cases of extreme weather. Seeing the finished product, you can not only tell, but you can also see every glaring continuity error as a direct result of these reshoots – and all the while, it doesn’t prevent this movie from being any less stupid; if anything, it looks even dumber than it already probably was. So according to this movie, a couple of years from now global warming will get so bad that giant disasters will sweep the planet – or at least they would, if it weren’t for genius inventor Jake Lawson (Gerard Butler, in a casting kerfuffle that has you believing that he’s a scientist-inventor as much as Mark Wahlberg is in Transformers: Age of Extinction) who has single-handedly designed and apparently built a giant space station that sends down a small group of satellites to get rid of any disasters before they even happen. However, when a series of global weather disasters strike, Lawson is sent up to space by his younger brother (Jim Sturgess), who works in Washington DC alongside the President (Andy García), to help fix the problem, but once up there he soon discovers that a terrorist unit has somehow infiltrated the system and is causing the weather to get out of control, leading to water flooding Dubai, ice freezing over Rio, and feurewbu;rwquigrwbuRWrwqig1jbewyvjej’EYVasijQVH3 – oh, my apologies, it appears I became so dumb while tying this plot I managed to type complete gibberish instead, and I’m leaving it in to prove my point on how this is perhaps one of the dumbest movies ever made. The fact that the entire set-up is completely ridiculous and wouldn’t pass for an average episode of Doctor Who (let’s say the McCoy era) is the least of this film’s worries concerning its IQ test; characters say and do things that no normal person in this situation would ever say or do, except in the imagination of whoever wrote this thing; physics are defied both left and right – one prays for a Neil deGrasse Tyson live-tweeting of this movie, which would contain material that would be longer than the movie – which make for some implausible and hilariously stupid hero moments; and the motivations of the villains, once you find out who in fact they are (though it shouldn’t be too difficult to figure it out when you start watching), are so mind-blowingly lame-brained when you think about what they had to do in order to accomplish it. Not since Gods of Egypt, another effect-heavy Gerard Butler film that was so dumb it depicts the Earth as being flat, has there been a giant spectacle of stupid-with-a-backwards-“s” visuals and ideas that it transcends being just another bad disaster movie, into being a bad disaster movie that is so dumb you find yourself laughing at its increasing incapacity to do anything right. Making it seem even stupider, however, is that every single person involved in this is taking it incredibly seriously. In the right hands, with a plot and a script this low in the IQ department, this would have been a self-aware parody of the genre, and if executed right it could have been one of the funnier spoof movies since Airplane! ; but in reality, this is the kind of dumb movie where everyone from the actors to the director is treating this like it’s truly harrowing, that you should be genuinely invested in the emotional impact of its characters and story, despite the fact that these are stock characters you’ve seen in pretty much every disaster movie ever made, and that this story would only seem smart to cavemen. When an actor has to have an emotional moment while saying some of the most ludicrous dialogue since the last cheesy disaster film, you find yourself wondering how much they tried to suppress their laughter while trying to act and speaking these lines at the same time. When we are witnessing some of the actual effects-heavy sequences of cities being destroyed and the like, it’s accompanied by a genuine sense of doom and gloom, which given everything else in this movie really should have been more tongue-in-cheek and knowingly bonkers instead of being stupid yet tying to act smart. It’s quite marvellous that such an idiotic movie exists, and even more so that it does it all with a straight face all throughout. When it comes to stupidity, it doesn’t get any dumber than this; if you’re seeking what is surely going to become a legendary new bad dumb movie, put this on and have a laugh with your mates, because this is one where your IQ will drop considerably, but you will never cease to be amazed by its complete ineptitude. 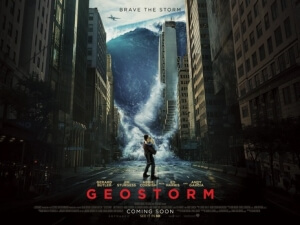 Geostorm is one of the dumbest disaster movies ever made, with absolutely nothing about it making any logical sense, and appears even dumber when you realise it’s all being played completely straight, when nobody in their right mind would pass this off as anything other than an unintentional comedy of errors.